I figured I’d get the last two Quest for Clues books out of the way. I was planning on doing a post for every Origin book but I’ve regretted not putting all the Quest For Clues books in one post ever since I moved onto the second volume. I really don’t have a lot to say about them and I said it all in the first post so I’ll keep this short. The books undergo a name change this time and were both published in 1992 by Origin. First off we get the Book of Orbs. This contains 20 solutions to various games as shown on the back cover below. Second is the Manual Of Swords containing another 20 solutions. The books are a smaller format than the first four and also thinner. There were as many solutions in any of the other books as both these two put together but I don’t know if the price went down to reflect this. The solutions take the same format as ever, with simple maps and brief walkthroughs submitted by QuestBusters guild members. 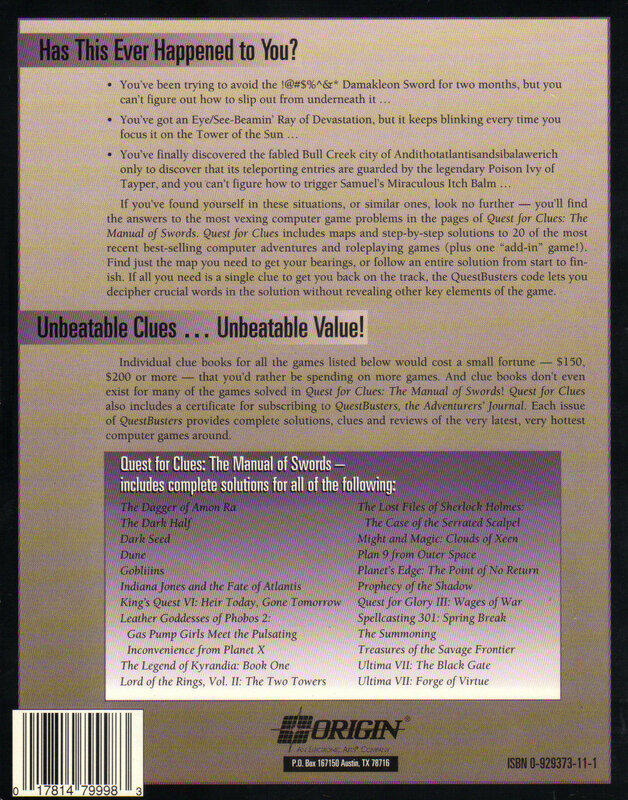 I was starting to get walkthroughs and tips from magazines around the time this was published but this whole series still potentially represented value for money as magazines would often spread solutions over several issues. 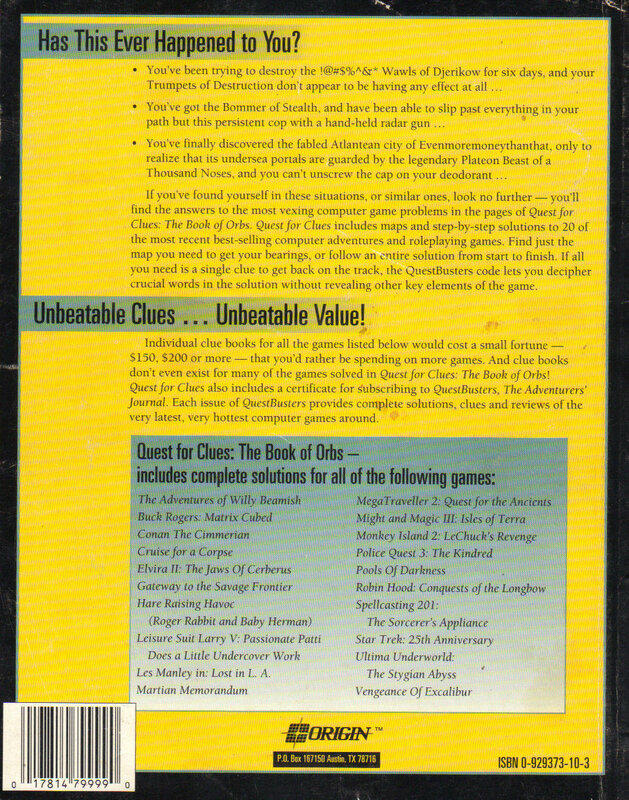 The Quest For Clues series was certainly great when I needed help playing through all of Origin’s games but it’s surprising that they included solutions for games like the Ultima’s since you would think it would hurt sales of the official clue books. As collectibles these don’t have a lot going for them, whereas most of the official cluebooks are full of all sorts of bits and pieces of background information making them more worthwhile. Unless you are trying to buy up everything Origin then there isn’t much reason to own them. Speaking of which, I’ve managed to get hold of System Shock – ICE Breaker which is the only clue book I was missing. I’d quite like to get the Cybermage comic books if I ever see them but those and Caverns Of Callisto are about the only Origin bits and pieces that I’m still looking for. I wouldn’t say no to a copy of Akalabeth either but judging by a recent Ebay auction I’ve about as much chance of getting my hands on one of Richard Garriott’s spare copies as buying one online.